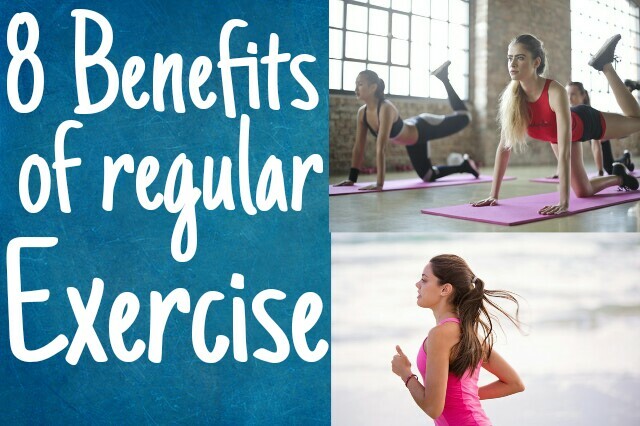 8 benefits of regular exercise. this means that exercise not only gives us a healthier body but also a healthier mind he has 8 benefits of exercise. The heart is a Muscles and neat click size to stay in shape when it's exercised the heart can pump more blood through the body and continue working at optimal consistent exercise improve the flow of blood in vessels and arteries, good blood flow always keep you away from illness and many disease and also cholesterol exercising 30 minutes a day or you can even break it up to quick manageable 10-minute sessions three times a day which will improve your heart health and helps reduce your risk of heart disease. Better sleep is very important for the allover body growth, when we do exercise the total tension pass on cell and muscles,and the muscle are breaks and stretch. SO, for recovery of that muscles our body fall on bed temperature may promotes falling asleep exercise may also reduce sleeplessness by decreasing arousal anxiety and depressive symptoms exercise may reduce insomnia by its effect on body . Exercise increases our blood flow to our brains lifts our moods from new neurons and will leave some white gel brain chemicals known as endorphins Exercise generates that release of serotonin norepinephrine and dopamine in the brain exercise also increase the brain's learning and memory capacity. Increase in strength and flexibility trance training whether you are lifting weights doing body weight exercises or incorporating yoga moves it will help you improve muscle strength and muscle mass which is very important as we age it also keeps bones strong as a great natural treatment for osteoporosis don't forget about stretching, If you doing few minutes of daily stretching exercise,it help to reduce the risk of cardiovascular diseases because the stretching improving the blood circulation in muscles. Increase in energy levels when we use our muscles in a manner that progressively increases their capacity for endurance or strength the number of powerhouse cells that are called mitochondria in muscle tissue increases and the capillaries that provide blood flow to the muscles also increase in numbers all of which increases our overall energy levels. Better Immunity help to remove or flush the bacteria which comes in our body in the way of taking Oxygen,eating,drinking etc. which reduce the percentage of illness while we doing Exercising or do any physical activity.exercise causes changes in antibodies the body's immune system cells that fight disease and these cells circulate more rapidly.the best way to exercise is to select a consistent lock of time at which you can exercise on a daily basis consider your physical ability how much time you have and what you enjoy doing try to engage in a combination of vigorous and moderate aerobic exercises within strength training at least twice per week by lifting free weights using weight machines or doing body weight exercises remember to check with your doctor before starting a new exercise program especially if you haven't exercised for a long time or having a chronic health problems such as heart disease,diabetes, arthritis or any other health conditions.Better to consult your doctor before start the exercise. Avoid the dis-balance of hormones by regular exercise.